because this is not a credit card. It’s easy to get a high yield savings account. Peace of mind for your wallet. Mango is the safe and convenient way to manage and access your money when and where you need it. You can use your Mango Card everywhere Debit Mastercard is accepted. 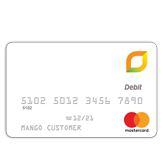 The Mango Card is a prepaid card account and there are no hidden fees or interest charges. 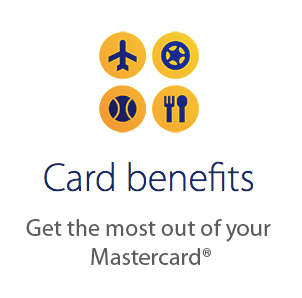 See your Cardholder Agreement for fees and details. Mango makes it easy for you to manage your money on the go with our mobile solutions: Mango Mobile-enabled cardholder portal. Manage your account anywhere you are. Securely check your balance, transaction history and send money to friends and family. No need to wait to start saving. Once you activate and load your Mango Card, you can open a Savings Account with as little as $25 and get up to 6.00% Annual Percentage Yield. You can enjoy up to 6 transfers out each month. Signature purchases of $1,500 or more and a minimum balance of $25.00 at the end of the month is needed to qualify for the 6.00%. You may only have one Savings Account. 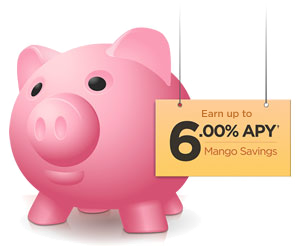 All active Mango Cardholders are able to open a Mango Savings Account. We encourage you to enroll in Direct Deposit and make regular transfers to your Savings Account. Basically, we’ve shifted a big chunk of our marketing budget to paying our good customers instead of advertising channels – no TV or print ads. We think word of mouth is much better. We believe that the amazing 6.00% is our contribution to improving our customers’ finances, and building a better America. Once customers have savings in excess of $2,500, they have the tools and have established the right habits. > We may change the interest rate on your Savings Account at any time. > We offer a fall-back Annual Percentage Yield of 2.00% for those accounts with a $25 average daily balance and signature purchases between $750 and $1,499.99. See Savings Account Terms and Conditions for additional details. Tell your friends about any of our services and the earning is unlimited. Whether your friend wants a high-yield savings account or a better way to manage money Mango pays you to tell them. Gain access to a wide variety of offers and deals, including travel, food and wine, dining, shopping, sports, entertainment and more. At Mango we take many steps to ensure your money is safe. 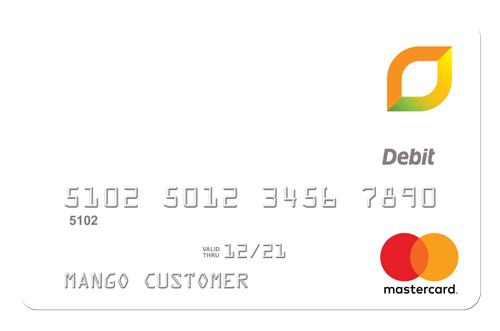 > Mango is dedicated to keeping your money safe by monitoring transactions to prevent fraud. > Using Mango is safer than cash. Your card can be replaced if it’s lost or stolen, just call our toll-free number and one of our customer service agents will gladly assist you to cancel that card and send you a replacement.